There are many things that we see at CES that, as a group, we love, but we definitely have an affinity for unique cameras. Insta360 totally fits that description, as they are different than the other 360° cameras out there because from their point of view, it's the software that comes first. That makes all of the difference in the world, because it also allows a lot more expertise and fun on the back-end due to their emphasis on programming. When you purchase one of their cameras, that's not where the transaction ends. You can count on firmware updates going out on a regular basis. They even design their line with full knowledge that improvements are coming, and these updates include some really cool features. All throughout the process, they stay true to their mission to create a product that's friendly, easy to use, powerful and price efficient all at the same time. The best part of their "software first" approach is that with everything they produce, they develop and then redevelop and then listen to customer feedback and continue to improve based upon actual user experiences and wishlists. The company is 60% Research & Development engineers who are used to turning thing around quickly. We took a look at the Insta360 ONE: the world's most powerful action sports 360 camera. It is compatible with a variety of accessories including a stick that pops out for a longer range. Within the software, you are able to do some cool things like magic erases and it enhances their overall content. It's like having a drone follow you everywhere you go and is perfect for skaters, bikers, runners, joggers and more. Since it's a 360 degree camera, you can also change the perspective after the video is shot. There's a normal mode and a planet mode, which is a spherical look. The camera is capable of taking 24 megapixel stills and 4K UDH video. You can also livestream directly to your social media platforms or you can edit within the app and then share those edits directly to social media as well as save to your albums. It is capable of Bluetooth control or it can be connected directly to a cell phone. They are available on Amazon and you can get yours by clicking here. Next up is the Insta360 Nano S, the little marvel that has been winning every 350 camera award at CES. This camera has redefined what software means for a 360 camera. It plugs into your phone and the social interactivity is what makes it extra special. The Multiview feature is like having an entire camera crew in your pocket. You are also able to use a split screen or a bubble inside of a larger screen to get multiple camera angle views all at the same time, using different pieces of footage. You can even livestream in Multiview. It really lets you experience full immersion without having to lug a ton of heavy and expensive equipment everywhere you go. You can pick yours up on Amazon by clicking here. 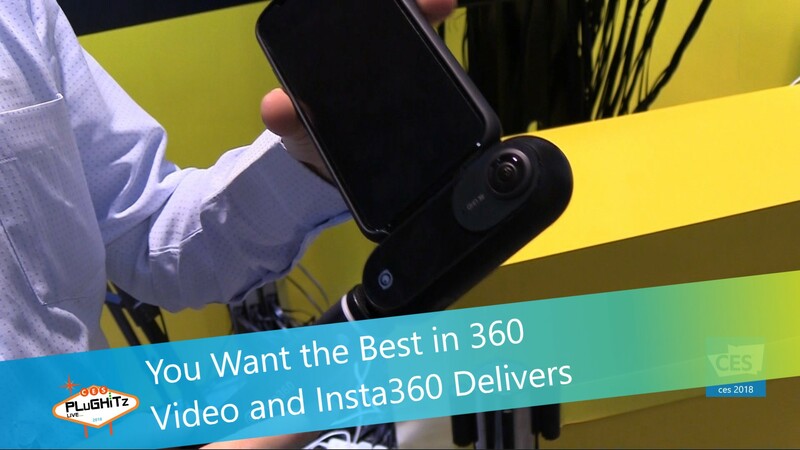 Insta360 has also recently ventured out into the world of professional videography equipment. The new 6 camera configuration shoots in 12K for stills and 8K for videos, and it will livestream in that same quality without the need for additional accessories. It's a one stop shop for filming your favorite music festival or sporting event. And let's not forget the big daddy: the Titan Series, that will be available later in the next year. It features their first pro world camera. It's larger with more cameras and a long range wireless transmission device and has a resolution of 12K for stills and upgrades the video transmission to 10K for video. And yes, it will livestream in that same quality without the need for additional accessories. For more information, you can visit their website at Insta360.com.